Vinland is known to some as a “hamlet” or community that is smaller than a village. This rural destination, nestled north of Baldwin, is the home of a charming old structure, known as the Vinland United Methodist Church. 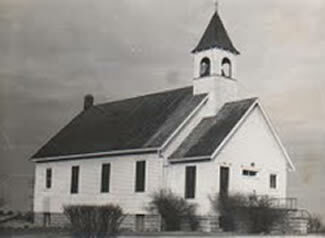 Still standing in the same vicinity as its original structure, the church is located just off of county road DG 700. Just north of Lawrence and out into rural Douglas County, the early morning sun casts long shadows across the grain elevators of Midland Junction. Farmers from the countryside begin to congregate inside the historic farm and feed store that stands to the northwest and beside the railway. Inside this quaint and nostalgic locale conversations are accompanied by a free cup of black coffee. Grain prices are scratched on the blackboard that hangs behind the counter and the static filled radio plays the country and western sounds of Hank Williams. 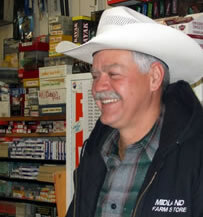 Midland Farm and Feed has been a gathering post for farmers and other rural residents living in the northeastern corner of Douglas County for many generations. Today it continues to be a reminder of life as it was generations ago and is a destination for individuals who want to continue to share in that experience. "Kansas Riverking,” a name or title that could mean a variety of different things to different people. It is however a term that categorizes a specific population of people, living in a very specific way, at a certain time in history. The Kansas Riverkings were a group of men who were born in the late 19 th and into the mid-20 th centuries; they were great adventurers whose lives were spent on and around the Kansas “Kaw” River. The media world is moving further away from printed material forcing many publishers to make lasting changes. Today online newspapers, e-books, and digital magazines place the “ink to paper” method on a fast track to becoming obsolete. In towns where more than one news source is produced, some don’t survive. 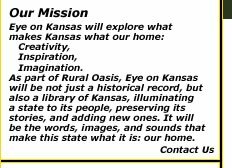 In rural Kansas, survival is based on adaptability, understanding of economy, changes to the target audience and acceptance of technological advancement. On a wide-open stretch of land situated in the small town of McLouth, Kansas people like to gather for what is known as the annual Threshing Bee. It is a time for celebrating farming as it was long ago and a time for bringing together the community for this summer celebration. It is a place where antique steam engines and gas-powered tractors bring a powerful presence to the countryside. Individuals and families gather with lawn chairs, blankets and an excitement about seeing these rare and majestic beasts. The sound of roaring motors causes the ground to rumble as visitors approach the grass covered field situated on the outskirts of McLouth, Kansas. Crowds of people hurry from their cars with blankets, coolers, and lawn chairs in hand. Everyone is required to stop, pay, and have a florescent green band placed on their arms before entering the area. It’s not a demolition derby or a county fair, it’s not an outdoor concert, or a rodeo. It’s the 2013 Kansas Summer Nationals Tractor Pull. This annual event brings out huge crowds of people including teens, the elderly and young families; there is excitement in the air for everyone to enjoy. Nestled in "beautiful, tropical, downtown, Tonganoxie, Kansas," as the locals like to say, visitors will find the sounds of the Grand Ole Opry and the stage lights and excitement of a little "Branson" Missouri at Annie's Country Jubilee. This little, musical powerhouse provides visitors from all over Kansas and outside the state with a taste of country that you might otherwise have to travel quite a distance to enjoy.